Princeton University Press has announced the release of The Law Is a White Dog: How Legal Rituals Make and Unmake Persons, by Colin Dayan (Vanderbilt University). The TOC and a sample chapter are available here. The Seattle University Law Review has posted, ungated, its symposium number, Berle II: The Second Annual Symposium of the Adolf A. Berle, Jr. Center on Corporations, Law & Society Symposium. As did its first symposium, this issue several articles of interest to legal historians. These include The Twilight of the Berle and Means Corporation by Gerald F. Davis; Frank H. Knight on the “Entrepreneur Function” in Modern Enterprise by Ross B. Emmett; Berle and Veblen: An Intellectual Connection, by Charles R. T. O’Kelley, The Judicial Control of Business: Walton Hamilton, Antitrust, and Chicago by Malcolm Rutherford; and Chicago’s Shifting Attitude Toward Concentrations of Business Power (1934–1962) by Robert Van Horn. The postwar Chicago School is commonly associated with a pro-corporate standpoint because of its position toward antitrust law and business monopoly. For example, starting in the 1950s, Aaron Director—who is often considered the father of Chicago law and economics—and his students, such as John McGee, defended the practices of the Standard Oil Company, arguing that the Supreme Court’s holding against the company in 1911 was erroneous. Since that time, Chicago has been associated with the position that competition has a self-correcting power, ensuring that monopoly power is short-lived. This Essay traces the development of the Chicago School’s changing position toward concentrations of business power. In Parts II and III, the Essay details the Chicago School’s early position of broad hostility toward concentrations of business power and its belief that such concentrations of power needed to be eradicated by vigorous antitrust enforcement and radical corporate reform. Then, in Part IV, the Essay charts the Chicago School’s shift during the Free Market Study toward a broad acceptance of concentrations of power and a position that large corporations and industrial monopoly were relatively benign. This Essay argues that the Chicago School’s shift toward concentrations of power was a product of the postwar Chicago School’s effort to reconstitute liberalism as a bulwark against collectivist challenges and increasing government regulation of business. Thanks to Mary and the rest of the crew here for inviting me to guest-blog. It's been fun! Alas, life has interfered, and I haven't had a chance to write these, and won't by tomorrow. But I'll probably address all of these issues at some point at my usual blogging home, volokh.com. Hope to see some of you there. My guest month is winding to a close and since I’ll be traveling Tuesday this is probably my last post unless I’m stuck in some airport. So let me thank Mary and the rest of the Legal History Blog folks for inviting me over; it’s been fun. And thanks, too, to the folks who commented and/or wrote me personal emails about my posts. I’ve appreciated those messages, as well. Before I leave, I wanted to address a couple of comments to my last post, and follow up on Mary’s response to one of those comments. The comments dealt with the issue of whether legal history was in fact a moribund field; one commenter asked me why my colleague suggested it was; another was worried that at some universities legal history not as popular as other history courses. Levée en masse – the spontaneous uprising of the civilian population against an invading force – has long been a part of the modern law of armed conflict with regards to determining who may legitimately participate in armed conflict. The concept originated during the French Revolution, and was internationalized with its inclusion in the rules of armed conflict adopted by the Union Army during the American Civil War. Levée en masse continued to be included in the major international law of armed conflict documents from that time on, including The Hague Regulations of 1907 and the Geneva Conventions of 1949. However, since that time, there have been few, if any, instances of levée en masse. This article examines the historical and legal development of the concept of levée en masse, charting its evolution from a general and sustained call to arms to the civilian population to the more strict 19th and 20th century legal categorization of civilians attempting to fend off an invading force. This article also examines the few instances of levee en masse in State practice, and, in doing so, assesses whether the concept retains any utility in 21st century armed conflict. Reading Obama: Dreams, Hope, and the American Political Tradition by James T. Kloppenberg is reviewed by David Greenberg in The New Republic/The Book. For Greenberg,the book is "a welcome addition" to works by academics on Obama, "not least because it is the first book to try to tease out a coherent political philosophy from the president." What Kloppenberg finds in Obama’s writing, however, is emphatically not opportunism, but something more explicitly philosophical. He believes that Barack Obama belongs in the venerable strain of American thought that runs from William James and John Dewey to Richard Rorty and his disciples. This pragmatism deems ideas as valuable for their real-world utility and consequences: true ideas, it holds, are those that work. It rests on a commitment to experiment, a frank acknowledgment of human fallibility, an impatience with the search for a grander truth, a rejection of a priori absolutes. It is Kloppenberg's "portrait of academic thinking in this period may well be his book’s signal contribution." But the author's "esteem for Obama leads him to over-value Obama as an intellectual." Read the rest here. Also posted, a classic TNR essay, Death Penalty Litigation by Alexander Bickel, originally published August 19, 1967. The Greater Journey: Americans in Paris by David McCullough is reviewed in the Los Angeles Times, the San Francisco Chronicle, and the New York Times. Adam Goodheart, 1861: The Civil War Awakening is reviewed in the Washington Post. The Gilder Lehrman Institute of American History has just posted podcasts of quite a few lectures on its website, all downloadable gratis, though you will have to register to gain access. Particularly noteworthy is forty-five minutes' worth of David Armitage on The Declaration of Independence: A Global History. Calling all grad students! The Historical Society wants to hear from you. 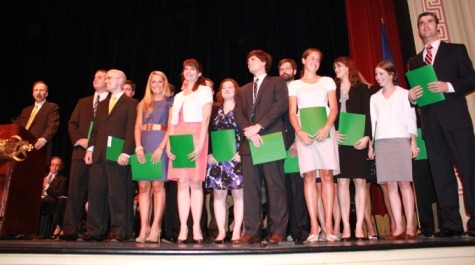 Blogger Dan Allosso is putting together a series of posts on the "challenges and opportunities" that today's graduate students face as they prepare to become professional historians. "The Lost Origins of American Fair Employment Law: Regulatory Choice and the Making of Modern Civil Rights, 1943-1972, published by David Freeman Engstrom (Stanford--Law) in the current volume of the Stanford Law Review (Volume 63, no. 5, May 2011), may be of interest to readers of this blog. The abstract of the article follows, and the full article is available here. By the time Congress enacted Title VII of the Civil Rights Act of 1964, roughly two dozen states had already passed fully enforceable employment discrimination laws and engaged in nearly two decades worth of enforcement efforts. But this early state-level scheme was very different from what most lawyers know as Title VII. Title VII vests primary enforcement authority in the federal courts. By contrast, beginning in the mid-1940s, civil rights groups championed, and states enacted, employment discrimination laws that vested exclusive enforcement authority in administrative agencies. In this Article, I ask why civil rights groups in the 1940s preferred an administrative approach to regulating job discrimination over available (and potentially more effective) court- and litigation-centered approaches. Drawing on extensive original archival research, I trace the agency choice to a series of strategic conflicts among civil rights groups about how best to attack job discrimination as well as a troubled but necessary alliance with organized labor. Understanding the social movement and coalition dynamics at work in the early drive for fair employment, I argue, has important implications for how we think about the legal strategies civil rights groups pursued before and after Brown v. Board of Education, the form Title VII ultimately took, the subsequent emergence of “affirmative action” policies, and the broader postwar move away from administrative regulation and toward private litigation as a regulatory tool. A number of years ago, when I was still teaching at Clemson, I invited Kermit Hall in to give a talk. At the dinner after his lecture, he turned and asked what I thought of the state of legal history. As a practical matter, I thought legal history was in pretty good shape. I knew lots of people who did legal history, many of them fresh out of law school. I thought quite a few people were doing interesting things in a lot of different areas. So I said something vague to that effect. It was pretty clear he was not so sanguine, though he didn’t elaborate much more than I had. Since I had invited him down to give the talk as part of some scheme to convince the administration that Clemson should be doing something New! and Exciting! in legal history (I forget what, I am constantly trying to convince administrators I should be allowed to do something New! and Exciting! in legal history; it all runs together in my mind) I was just as glad that someone else changed the subject. younger scholars in the field, including recent Ph.D. or advanced Ph.D.
critique at the workshop itself. Please email your inquiry or proposal to: lc2069@gmail.com. History and Tradition in American Military Justice has just been posted by Samuel T. Morison, Office of the Chief Defense Counsel, Office of Military Commissions, United States Department of Defense. (He notes that the views expressed in the article are his own, and not those of DOD.) The article will appear in the University of Pennsylvania Journal of International Law, Vol. 33, 2011. Although related to contemporary litigation, history is very much at stake in pending cases involving Guantánamo detainees, and the author reflects on the consequences of using morally questionable precedent to bolster contemporary actions. Building on Stephen Macedo's distinction between history and tradition, with tradition "a critical distillation of the past, a rendering that seeks to be true not to the past entire but to what is best in it, to what is most honorable and most worth carrying forward,” Morison argues that "we should be loath to accept the Government's jarring invitation to incorporate Andrew Jackson's summary trial and execution of two innocent men into the tradition of American military justice." At present, there are two military commission cases involving terrorism defendants incarcerated at Guantánamo Bay making their way through the appellate courts. In both cases, the defendants are challenging their convictions for “providing material support for terrorism.” While this is a federal offense that could be prosecuted in an Article III court, the legal issue in these appeals is whether providing material support is also a war crime subject to the jurisdiction of a military tribunal. Congress incorporated the offense into the Military Commissions Act, but that is not dispositive, since it is arguably beyond Congress’ legislative competence to create war crimes out of whole cloth and then impose them on foreign nationals having no jurisdictional nexus to the United States. As a result, the Government has not disputed that there must be at least some historical evidence that the conduct now styled “providing material support” to an enemy previously has been treated as a war crime, where the defendant was a non-resident alien who owed no duty of allegiance to the injured State. In what might be fairly described as a desperate attempt to discharge its burden of persuasion, the Government has now embraced the only “precedent” that comes close to fitting this description. This is problematic, however, because it is also one of the most notorious episodes in the history of American military justice. 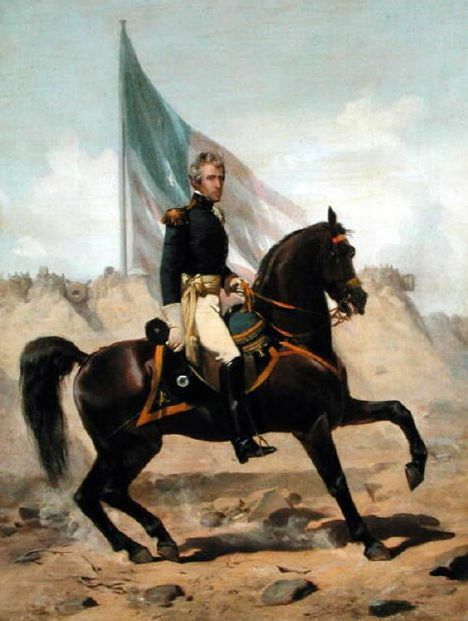 In 1818, then Major General Andrew Jackson led an armed invasion of Spanish Florida, thereby instigating the First Seminole War. In the course of the conflict, his troops captured two British citizens who had been living in Florida among the Seminole Indians. In his inimitable style, Jackson impetuously ordered the summary trial and execution of these men, allegedly for “inciting” the Seminoles to engage in “savage warfare” against the United States. Worse yet, Jackson’s immediate motivation for the invasion was to recapture fugitive slaves, who had escaped from the adjacent States and found refuge among the Seminoles. In addition to territorial expansion, his mission was to return this “property” to their “rightful” owners and prevent Florida from serving as a safe haven for runaway slaves. Remarkably, the legal basis of the Government’s assertion of military jurisdiction over material support charges therefore rests on Jackson’s decision to execute two men, who were almost certainly innocent, in the context of a war of aggression waged to vindicate the property rights of antebellum Southern slaveholders. The purpose of this essay is to reintroduce the episode to a wider audience, and to reflect on the implications of the Government’s decision to rely on it as a precedent for a modern war crimes prosecution. Though copyright is usually categorized as a property right, efforts to justify copyright on other grounds have persisted since the eighteenth century. The Lockean defense, based on the author’s labor, is usually seen as conducive to a property right, but is sometimes linked instead (or in addition) with a personality right. I explore another approach that has been analyzed in the doctrinal literature, but that has received less attention from historians of English copyright law. This approach focuses on the author’s dignitary rights, including communicative rights (bearing on who controls the public presentation of the text), and reputational rights (bearing on the text’s appearance and its status as a reflection of the author). By contrast with the labor theory, the dignitary view of copyright is harder to reconcile with a property right, although as I show, eighteenth-century advocates of strong copyright protection sought to assimilate this view into the property framework. The Act of Anne (1710) sought to accommodate the competing needs of authors, publishers, and the public. Its protections did not affiliate copyright with a property framework, as the publishing industry would have liked. In the course of the eighteenth century, dignitary concerns jostled with property claims as litigants argued over statutory protection. To explore the relations among these arguments, I reexamine the Act of Anne and four of the major contemporary copyright judgments: Burnet v. Chetwood (1721), Pope v. Curll (1741), Millar v. Taylor (1769) and Donaldson v. Becket (1774). Each of these cases reveals new dimensions when examined through the lens of dignitary concerns. By studying these materials, we can gain a better understanding of how the property-based view took hold during a vital period in the formation of copyright law. 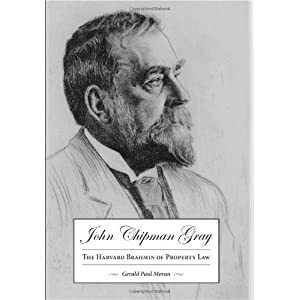 John Chipman Gray: The Harvard Brahmin of Property Law (Carolina Academic Press, 2010), by Gerald Paul Moran (Florida Coastal School of Law), is the subject of a recent review from the Law & Politics Book Review. First, although Moran notes that his book should not be described as a “definitive biography” of Gray (p.8), the work nevertheless chronicles the life of an important figure in American legal history. 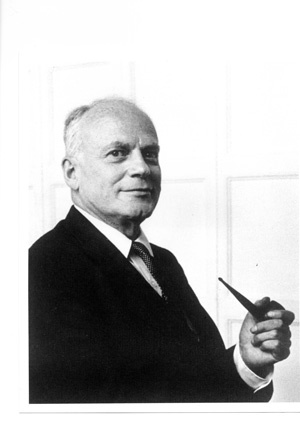 Second, and related, Moran attempts to demonstrate that Gray’s most notable contribution to the field of property law – his synthesis of the abstruse Rule Against Perpetuities (RAP) – is, in effect, a personification of his own character. In Moran’s words, “the focus of this study is on the symbiotic relationship of a man and his rule of law. They are inseparable” (p.17). The succeeding pages of Moran’s narrative set out to illustrate that proposition. 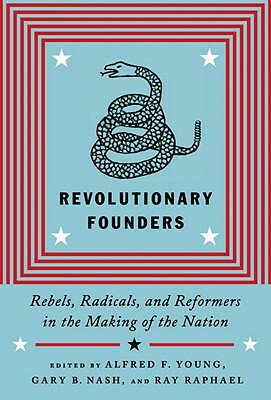 In addition to detailed discussions of Gray's scholarship, Curry notes, the book covers Boston’s Brahmin community (and its reaction to Gray's father's bankruptcy), Gray's relationship with his half-brother Horace Gray (the Supreme Court Justice), the founding of the elite firm Ropes & Gray, and Gray's experience on the law faculty at Harvard in the Langdellian era. H-Law has posted a review of David M. Oshinsky, Capital Punishment on Trial: Furman V. Georgia and the Death Penalty in Modern America (University Press of Kansas, 2010) (Landmark Law Cases and American Society series). Oshinsky, who holds the Jack S. Blanton Chair in History at the University of Texas, explores a curious paradox in American law and life that emerged during the middle 1960s. From that time forward for the next three decades, many more criminals were sentenced to death than during the previous generation, but only a tiny percentage of them were actually executed. Oshinsky does a fine job of explaining how the U.S. Supreme Court handed down a series of rulings (starting with the landmark case of Furman v. Georgia in 1972) that greatly diminished the states’ freedom to execute those convicted of capital crimes. He is especially good at describing the very serious splits within the Court on the death penalty issue from the late 1960s onward and their consequences. Oshinsky argues persuasively that the interpretive stance of Associate Justice Potter Stewart, who in Oshinsky’s words “appeared to want fewer executions, with scrupulous rules to punish the worst offenders” (p. 56), prevailed then, in opposition to those justices such as William O. Douglas, and Thurgood Marshall who wanted capital punishment abolished via constitutional interpretation, and those such as Byron White, Warren Burger, and William Rehnquist, who believed the death penalty enjoyed broad constitutional protection. The book's "one basic weakness," Stebenne finds, is its "tendency to under-contextualize how and why the Supreme Court became so concerned about, and involved with, the death penalty by the later 1960s." For those of you who haven’t looked in on the website of the Historical Society of the District of Columbia Circuit lately, here’s an update. As before the website is the portal to more than fifty oral histories of Washington lawyers and judges (including Robert Bork, Lloyd Cutler, Sam Dash, Warner Gardner, Erwin Griswold, and Joseph Rauh), brief biographies and a guide to the archived papers of the judges of the capital's federal courts, and links to two articles relating to the Circuit's history published in the National Archives's journal, Prologue: “Sweltering with Treason”: The Civil War Trials of William Matthew Merrick by Jonathan W. White and "You have the body": Habeas Corpus Case Records of the U.S. Circuit Court for the District of Columbia, 1820–1863 by Chris Naylor. More recently posted are videos of the Society’s programs, including Timeless Elements of a Great Closing Argument: Lessons from the Teapot Dome Trials; FCC Indecency Cases in the D. C. Circuit: An Historical Perspective; The Steel Seizure Case in Historical Perspective; The Pentagon Papers: Did the Courts Get it Right? ; The Watergate Cover-Up Trial. Forthcoming is the video of a program I had a hand in, The D.C. Circuit in the McCarthy Era: United States v. Lattimore, held on May 12. Here’s a teaser: descendants of two of the depicted were in the audience! I apologize for the radio silence, I spent the past week or so enveloped by a swarm of page proofs--page proofs for books, page proofs for articles, anything that I had out there with some publishing entity appeared before me in page proof form within the past ten days. I guess I like the fact that it's possible to use the sticky note function to make corrections on proofs without having to print them out and write cryptic codes on the margins, but I am a shadow of my former self. Of course, that might be a good thing. At the very least, I'm sure the dramatic streaks of white in my hair make me look almost distinguished and wise. As anyone who has read proofs knows, there comes a point where you simply can't read another page that day. Unfortunately, I don't seem to be good for much of anything else when I hit that point, so I spent my free time staring into space and obsessing. And for fairly obvious reasons, I started obsessing, once again, about the issue of using books in law school classes and what works and why. I did have a number of thoughts. It seems to me that the couple of times I assigned "short" books (say 200-250 pages) that worked pretty well. But I also had some success using a fairly long book as a sort of text that we returned to week after week, using different chapters as reading for the week. New review essay: Kornbluh on "queer legal history"
Last summer, we noted the exciting work coming from the intersection of legal history and the history of sexuality (here and here). In the Spring issue of Law & Social Inquiry, Felicia Kornbluh (University of Vermont) brings the field together under the banner of "queer legal history." Her essay reviews recent work from Margot Canaday, Marc Stein, and Sarah Barringer Gordon, as well as slightly older work from George Chauncey and Elizabeth Hillman. Kornbluh begins with what Kevin Cathcart, executive director of Lambda Legal, used to call the “gay exception” to major doctrines of US law: "every just and compassionate aspect" of state and federal law seemed to exclude Lesbian, Gay, Bisexual, and Transgender (LGBT) people. The compelling questions for historians of law and society concern the nature of the “gay exception,” its origins, and the source of its erosion. In the depressing Clinton years, and even as the Lawrence v. Texas (2003) decision was being handed down, scholars did not know enough about the past to answer these questions. Now, thanks to a generation of scholarship that has itself been influenced by the movement for LGBT rights, we begin to. Much of the recently published work was begun when Cathcart's “gay exception” had its strongest hold; undertones of fury are audible despite the authors' scholarly rectitude and academic style. This body of work joins the insights of women's and gendered legal history with those of contemporary sexuality studies (as well as political history, constitutional history, historical political science in the American Political Development tradition, the history of social welfare, and immigration history) to generate, “what,” in the words of historian Marc Stein, “might be called queer legal history” (Stein 2004, 111). In the rest of the essay, Kornbluh discusses the theoretical contributions of queer legal history and the insights that queer legal history brings to the historical study of marriage, the welfare state, the U.S. military, and immigration. If you can find a way to access the full text via your institutional subscription service (it is only available to subscribers), I highly recommend it. The article locates the origins of the scientific tradition on which the Brandeis Brief drew in early 19th-century British efforts to frame labor laws as health interventions in order to overcome barriers to interference with market relations. In turn, this strategy led to the emergence, first in Britain and later in the United States, of a conservative claim equating common law constitutionalism with the requirement that courts be made guardians against laws passed under the false pretext of public health. It was in response to this line of argument that American progressives, towards the end of the 19th century, came to insist that courts owed legislators deference regarding the existence of health justifications for legislation ranging from restrictions on the marketing of margarine to limits on work hours. Lochner’s ultimate rejection of this presumption forced progressives to shoulder the burden of proof and gave rise to the Brandeis Brief. It was at this juncture that formalism emerged as an explanation for the delayed deployment of such briefs until then. Earlier today, I focused on myths about Lochner and other liberty of contract cases. Now, I’m going to focus on myths about the views of the Progressive jurists who opposed the liberty of contract doctrine. The traditional narrative posits not only that the Justices who supported liberty of contract were evil reactionaries whose influence has been thankfully purged from modern constitutional law, but that their Progressive opponents were enlightened liberals, who bequeathed to us a shift in the constitutional landscape from a protection of contract and property rights to a primary focus on the protection of civil rights and civil liberties. In fact, as a rule, Progressive opponents of liberty of contract evinced little interest in civil rights and civil liberties. Indeed, Progressives jurists typically did not distinguish among different categories of rights. They instead thought that the very notion of inherent individual rights against the state was a regressive notion with roots in reactionary natural rights ideology. There’s a limit to how much detail I can go into in a blog post, but the Progressives’ general outlook is well-reflected in Learned Hand’s (in)famous lectures on the Bill of Rights at Harvard Law School in 1958. At eighty-six years of age, Hand was and remained an unreconstructed Progressive, immune from the New Deal and Post-New Deal liberal trends in constitutional law. At Harvard, Hand denounced the Supreme Court’s recent liberal civil rights and civil liberties jurisprudence. Hand specifically criticized the Court’s protection of freedom of expression via incorporation of the First Amendment into the Fourteenth Amendment’s Due Process Clause. Hand alleged that there is “no constitutional basis” for the Court to exercise any more supervision over state and local regulation of freedom of expression than it did over liberty of contract. Hand went on to decry the notion that the Bill of Rights can or should be applied to the states. One could cite other examples. By now, Holmes’s reputation as a liberal civil libertarian is no more. Brandeis still gets credit for a certain amount of liberal farsightedness, but he also showed little interest in African American rights, was at best a tepid supporter of women’s suffrage, supported repeal of the entire Fourteenth Amendment, and, despite his famous opinion in Olmstead v. United States, rarely (unlike several of his "conservative" counterparts) voted against the government in Fourth Amendment cases. More generally, my book argues that Lochnerian protection of liberty of contract was invoked to justify some of the most significant early decisions expanding constitutional protections for the rights of African Americans (Buchanan v. Warley) and women (Adkins v. Children’s Hospital), and for civil liberties (Meyer v. Nebraska, Pierce v. Society of Sisters), often over the strong opposition of Justice Holmes and his Progressive allies--for example, almost every Progressive commentator opposed Buchanan's rejection of de jure housing segregation. Modern “liberal” constitutional jurisprudence, rather than being directly descended solely from the ideas of early twentieth century Progressive jurists, is a synthesis of Progressive fondness for government economic regulation, and the classical liberal (“conservative”) support for individual rights and skepticism of government power reflected in the liberty of contract cases. Famous Carolene Products footnote 4, for example, is best seen not as a novel innovation announcing the protection of civil liberties, but rather as a reflection of New Deal liberal determination to retain and reinterpret certain "Lochner era" Fourteenth Amendment precedents in the service of a modern liberal conception of individual and civil rights. At the same time, it was a repudiation of the Old Progressive hostility to judicial protection of individual rights in general, and cases like Meyer and Pierce in particular. 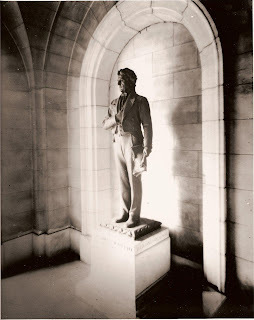 The statue of North Carolina Supreme Court Judge Thomas Ruffin that stands in a shadowy alcove at the entrance of a state court building in Raleigh was erected in 1915, toward the conclusion of a period of memorialization in the American South that was intended to reinforce in the public’s imagination a coherent story of American history that began with the Founding Fathers, continued through Robert E. Lee and the narrative of the “Lost Cause,” and worked to evoke “old family heritage, Anglo-Saxon supremacy, and military and political heroism.” Although Ruffin’s authorship of State v. Mann (1829), a case well known in its time (and now) for the stridency of the rhetoric with which Ruffin upholds the “power of the master,” is nowhere mentioned in the documentation surrounding the creation and dedication of the statue, that connection would have been inescapable to a white audience, which would have been largely sympathetic. But an emancipationist counternarrative, which was never really silenced, survives as a reminder of the strength and resilience of generations of Americans committed to equal justice under the Constitution. A recognition of this counternarrative has the potential to change the way we view Ruffin’s statue: the statement of the fixed and irrefutable power of law that it was no doubt intended to make unfolds into a conversation about the uses of law by the powerful. Such a shift of perspective, in turn, invites us into a broader reconsideration of our ways of navigating the contested terrain of public commemorative art. Mary invited me to guest-blog in part because my book, Rehabilitating Lochner: Defending Individual Rights against Progressive Reform, is being published this month. In fact, today is the official publication date. While the title is (intentionally) ambiguous, the book takes no normative positions on constitutional law beyond a not-exactly-bold stance against an unlimited state police power. I made this decision in part because my own views on such things as the scope of the judiciary's role in interpreting the Constitution, originalism, constitutional construction, and so forth are rather ill-formed. But mostly, I wanted to write a serious work of history, and was afraid that if I didn't resolve to avoid normative conclusions I would inevitably be tempted to skew my historical narrative to fit my arguments. Lochner v. New York, of course, is one of the most notorious Supreme Court cases of all-time, reviled by both left and right. My basic argument is that much of the calumny heaped on Lochner reflects the symbolic role it has come to play in constitutional debate, but has little to do with the actual history of the case itself, or with the broader "liberty of contract" line of cases of which it is the most prominent example. More on how that symbolic role arose in a later post. For now, I thought I'd briefly recount some of the myths and facts about Lochner recounted in my book. The ideas reflected in this post aren’t original to me; the relevant parts of the book are really a synthesis and elaboration of previous revisionist scholarship. I'll talk about some of the more novel aspects of the book later. Myth 1: Prevalent especially among conservative critics of Roe v. Wade, this myth states that the due process clause protects substantive rights originated in Dred Scott v. Sandford, the pro-slavery case decided in 1858. The point here is to discredit Lochner and its progeny by associating them with the defense of slavery. In fact, due process’s role in protecting substantive property rights was accepted before Scott in dozens of state cases that had nothing to do with slavery, and indeed by the Supreme Court itself five years before Scott. Moreover, belief in “substantive due process” was not limited to pro-slavery forces, and indeed was likely more prevalent among abolitionists. The Republican Party platforms, for example, of 1856 and 1860 argued that the Fifth Amendment’s Due Process Clause put substantive limits on federal endorsement of slavery. Myth 2: Via Lochner and other liberty of contract cases, the Supreme Court tried to impose “laissez-faire” on the United States. While the Supreme Court did invalidate a few significant regulations as violations of liberty of contract, for the most part it upheld innovative regulations. To take one pertinent example, the Supreme Court heard a half-dozen or so challenges to state maximum hours laws. It upheld each of these laws, with only one exception--Lochner itself. Myth 3: Lochner was the product of judicial formalism that ignored social science data and other evidence in favor of abstract notions of writes. In fact, Peckham’s opinion specifically stated that “in looking through statistics regarding all trades and occupations, it may be true that the trade of a baker does not appear to be as healthy as some other trades, and is also vastly more healthy than still others.” These statistics were provided in Lochner’s brief. Myth 5: Lochner and other cases invalidating labor regulations illustrate the Supreme Court’s hostility to workers and beneficence toward large corporations. This simplistic morality tale is belied by the facts of Lochner itself. For complicated reasons explained in the book, the law was supported by the German-dominated bakers union, and also by the large corporate bakeries that employed union workers. Opposition to the law came from owners of small, nonunionized bakers, who were mostly Italian and Jewish immigrants, and who thought the law was designed to put them out of business. Weizer reviews Collins, "The Fundamental Holmes"
Another recent post from the Law & Politics Book Review covers THE FUNDAMENTAL HOLMES: A FREE SPEECH CHRONICLE AND READER (Cambridge, 2010), by Ronald K. L. Collins (University of Washington School of Law). The TOC and an excerpt of the book (from Part I: On Life and War) are available here. Here's one I'm going to: the John W. Kluge Center of the Library of Congress is hosting "Michael Pertschuk and the Federal Trade Commission, 1977-1984," a lecture by the Kluge Fellow Eleanor Capper (University of Liverpool), at Room LJ-119, Thomas Jefferson Building, 10 First St., S.E., Washington, D.C., on Thursday, May 26, 2011, at noon. The Kluge Center explains that Professor Capper "will discuss the American consumer movement and government activism in the 1970s and 1980s and tell how one crusader tried to make the Federal Trade Commission more responsive to consumer interests. 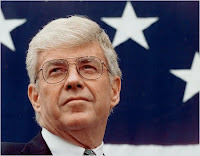 Michael Pertschuk, a longstanding and well-respected consumer activist in Washington, D.C., was chairman of the Commission during the Carter administration." For more information, contact scholarly@loc.gov, (202) 707-3302. Before the Revolution: America’s Ancient Pasts by Daniel K. Richter is reviewed by J.H. Elliott in the New York Review of Books. Richter is author of, among other works, the acclaimed Facing East from Indian Country: A Native History of Early America. During a time when "Founders Chic" is a trend, as Mary Beth Norton notes today in the New York Times, it's helpful to turn to a work that sets North American history in a broader context. One thing I especially like about Elliott's review is that it places Richter's new book in conversation with the broader literature it is a part of. continued to be shaped by three defining elements. It was Anglocentric, in the sense that it placed the weight of its emphasis on the contribution of British settlers, with some assistance from continental Europeans, primarily those of Teutonic origin, who were granted a kind of honorary Anglo status. It was teleological, in the sense that everything in the story built up to a logical conclusion in the winning of independence. And it was exceptionalist, in the sense that it was a story like no other about a nation that itself was like no other. These three pillars have been undermined in historical work over the past few decades, Elliott writes. "As far as teleology is concerned, the Whig approach to history, with its retrospective selection of those features of the past that are held to explain a distinctive, and equally selective, interpretation of the present, has fallen out of favor." In contrast to determinist readings, "historians are now more likely to see it as embracing a range of possibilities, and have become more aware of the need to keep their eyes open for the paths not taken." But it is the "Anglocentric pillar" that has "crumbled most dramatically." Richter's new book takes up the issue of how to write a synthetic history of this era that pulls the insights from new histories together with important parts of the traditional narrative. In this layered narrative, "there is no better antidote to the tendency to see the Revolution as beginning the world again than to take the North American story back to the Indian settlements at Chaco Canyon (in present-day New Mexico) and Cahokia (in present-day Illinois), and show how their inhabitants, and their descendants, contributed to the shaping of the world that the Founding Fathers inherited and wanted to remake." Richter does not build to an uplifting end-point with the American revolution, but instead presents "a dark and brutal story," "a history of violence." Ultimately, "Richter forcefully brings home to us that the American past belongs to many peoples, and that none should be forgotten." If you're going to read one book review this weekend, this is it. Read the rest here. Still, various omissions mean that the book is ultimately "one step, but only one, toward a comprehensive account of the nation’s origins." Read the rest here. Two books on Germany are taken up: EXORCISING HITLER: The Occupation and Denazification of Germany by Frederick Taylor in the Boston Globe, and Erik Larson, In the Garden of Beasts: Love, Terror, and an American Family in Hitler's Berlin in the Washington Post. We've devoted a few posts to Barbara Babcock's much-acclaimed biography of Clara Foltz, California's first woman lawyer. Another review, this one from H-Law, is available here. The Historical Society announced that it has $2 million to award in research support for "empirical, conceptual, and interpretive work exploring the role religion may play as a driving force of innovation in human affairs." Attention graduate students: The Institute for Constitutional History announced that it has extended the application deadline for its fall seminar, "The Constitution: A Cosmopolitan Examination" (mentioned on the blog here). The new deadline is September 1. More information is available here. Via Bridget Crawford at the Faculty Lounge, we've learned of a neat app from the New York Public Library. Biblion: The Boundless Library spotlights documents, images, and films from the Library's Manuscripts and Archives Division. The first issue is on the 1939-40 World's Fair. The Biddle Law Library Archives at the University of Pennsylvania Law School has processed the A. Leo Levin papers. The library describes Levin as a "leading figure in the history of Penn Law, the Philadelphia legal community, and the law profession at large." The latest issue of the Marquette Lawyer, the alumni magazine of the Marquette University Law School, has a lovely, illustrated article by Thomas Merrill, Columbia Law, on Melms v. Pabst Brewing Co., a chestnut of the American property law course. (The article abridges a longer version forthcoming Marquette's law review.) Judge Richard Posner comments. Congratulations to legal historian Sarah Gordon, winner of the Lindback Award for Distinguished Teaching at the University of Pennsylvania! Hat tip Feminist Law Professors. reason: because as interdisciplinary as the legal academy tries to be, it (more or less) continues to insist that members of that academy pursue questions germane to law and society. As broad as that net can be, and from where I sit it is indeed quite broad, historians coming to law from history often appear to be lost in questions of history that bear only a tenuous connection to the broader world. As fascinating as those questions can be, they often have no apparent relationship to law. From my own experience as a longstanding member of my law school's appointments committee, and as someone obviously sympathetic to the hiring of legal historians, I throw out another, related, thing to consider. Outside the very top, wealthiest law schools, most law schools either don't want to, or can't afford, to hire a "pure historian". It's not (necessarily) that they object to legal history as a methodology. Rather, they want to be sure that (a) faculty hires are able to cover big classes, such as first-year classes; and (b) that they will be interested in and able to interact on an academic basis with their non-historian colleagues. This means, in short, that being a really good historian won't be enough to get you a job at most law schools--you have to show a real interest in, and talent for, law, and you should also be aware of academic literature and trends outside of history that relate to your project. So, if you are writing a history of laws that prohibited and then allowed women to own property, and an interviewer asks, "is there a public choice story there?" or "how does this relate to Catherine MacKinnon's feminist interpretation of the common law, as expressed in her recent Harvard Law Review article," or, "does this effect how I should teach family law," saying, "well, that's outside the scope of my historical research," much less "what is public choice?" or "who is Catherine MacKinnon?," or "I don't concern myself with modern family law," just isn't going to cut it at most law schools, no matter how good a historian you are. I know that it's hard enough to get through one's graduate school classes, teaching, and thesis work without also having to worry about relevant non-historical literature. But it is what it is. Brooks reviews Hsueh, "Hybrid Constitutions: Making and Unmaking Power and Privilege in Colonial America"
The Law & Politics Book Review has posted a review of Hybrid Constitutions: Making and Unmaking Power and Privilege in Colonial America (Duke University Press, 2010), by political scientist Vicki Hsueh (Western Washington University). In his review, Christopher Brooks (East Stroudsburg University) wonders whether Hsueh "pay[s] short shrift to money, the primary concern of every colony" and ponders Hsueh's "curious omission" of the role of Enlightenment thinking. The full review is here. Religious concerns about pets are hardly new for Protestants. Martin Luther, if the Table Talk can be believed, thought there would be dogs in heaven with silver fur and gold tails. Billy Graham's Swedenborgian vision of heaven included dogs and golf. Likewise, post-rapture services for pets existed long before Harold Camping's predictions became part of the recent media frenzy. Last month the Miller Center of Public Affairs and the Jack Kemp Foundation "hosted a day-long conference on April 18 that brought together key figures who helped enact major tax-reform legislation during the Reagan administration. The gathering recorded for history the inside story of the Tax Reforms of 1981 and 1986, which were achieved at a time of deep partisan division, and explored how those lessons can be applied today. "Participants included former U.S. senators, Reagan aides, and congressional staffers. The conference featured a special keynote interview with former Sen. Bill Bradley conducted by veteran journalist Morton Kondracke." Archived webcasts of the conference are here. Matthew C. Mirow, Florida International University College of Law, has posted two new articles on the Spanish Constitution of 1812, also known as the Constitution of Cádiz. The reform of criminal law was an important aspect of the Constitution of Cádiz and one that was commented on and explained at length. Although not containing a list of enumerated rights, the Constitution provides for some individual rights, including rights of the criminally accused, at various places in its text. Fearful of unrestrained royal authority to imprison individuals, the Constitution prohibits the king from depriving individuals of their liberty or imposing punishment. It criminalizes actions of executive or judicial officials carrying out such royal orders. When, on account of the security of the state, officials detain an individual on the king’s order, the accused is afforded presentment before a judge within 48 hours. The Constitution places similar prohibitions on the king’s power to seize property. (Art. 172). In addition to imposing substantial limitations on the king related to accusing and punishing criminal suspects, the Constitution also contains a relatively detailed description of the power of the courts and their duties in criminal matters. Thus, only courts may try criminal causes; the function of courts is exclusively judicial. (Arts. 242-245). Judges are personally liable for failing to observe the law. (Art. 254). Prisoners have the right to know the crime for which they are charged and to be presented to a judge. (Arts. 287, 290). Punishment may only follow after an information of the facts, a violation of law, and judicial order. (Art. 287). Forfeitures of good are permitted only for crimes carrying a financial punishment. (Art. 294). The Constitution prohibits torture and confiscation. (Art. 303, 304). Searches must be conducted under law and only for the good order and security of the state. (Art. 306). Furthermore, the Constitution contemplates one criminal code of universal application throughout the nation. (Art. 258). Thus, the Constitution of Cádiz expresses the Legality Principle and ancillary aspects in several important provisions. This study analyses the origin of these and related provisions in the Constitution. It examines the debates of deputies in the sessions of the Cortes, explanatory works regarding the Constitution such as the Discurso Preliminar, and the writings of deputies to reconstruct the debate over the place of these provisions in the Constitution and the nation. Such provisions not only were the product of newer, liberal thought but also were grounded in and justified by the established practice of centuries of Spanish law. They accordingly provide a fascinating example of the deputies in Cádiz asserting the legitimacy of constitutional texts through political arguments that employed claims of both innovation and historicity. This study seeks to explore the private law side of the Constitution of Cádiz, in particular its use and reference to the legal revolution of codification that was well underway by 1812. By engaging questions of codification and private law, this study explores the relationship between private law and public law at a transformative moment in both areas. In public law, unwritten, ancient constitutions were just beginning to be replaced by written constitutions attempting to limit government and to define individual rights. In private law, centuries of the ius commune tradition were being reorganized and shaped into codes. Thus, an examination of the idea and place of codification in the Constitution of Cádiz should reveal clues about these important changes. First, this study discusses the placement of Article 258, the constitutional article referring to codes, within the text of the Constitution itself. It then addresses other aspects of the Constitution that point towards codification as a logical outgrowth of the political and legal transformations contemplated by the Constitution. The third topic addressed here is the way Article 258 came into the Constitution through the reports of the debates in the Cortes and what these statements reveal about the perception of codes at the Cortes. This study ends with some concluding comments about the place of the Constitution of Cádiz in the history of Latin American codification. Bernice Lotwin Bernstein (1908-1996) was born in a small town in northwestern Wisconsin. Her father had immigrated to the United States in 1895 from a part of Poland long settled by Jews and governed by Russia. By working on farms and trading goods, her father earned enough to pay for his wife and two sons to join him. In time he came to own a furniture store and some farm land. “We were the only Jewish family in the community,” Lotwin recalled. She received no formal training in Judaism. Instead, she tagged along to the Sunday schools of various local churches. “In school,” she recalled, “leading my class simply came very easily.” She received the medal awarded to the outstanding member of the graduating high school class even though she was only sixteen. At the University of Wisconsin her grades were again at or near the top. She also fell in with a circle of university-based reformers who were attempting to work out a system of unemployment insurance. (Several would later write the Social Security Act of 1935 and serve on the Social Security Board.) 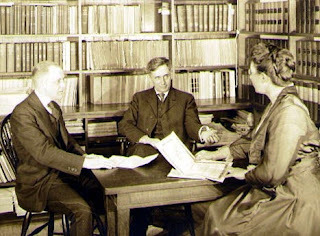 But Lotwin was no radical: she considered communism “a freak ideology that was not of any real concern in our country.” In 1929 she graduated Phi Beta Kappa as a philosophy major and won a prize for her undergraduate thesis, "The Philosophy of Justice Oliver Wendell Holmes and Its Influence upon His Legal Thought." A webpage noting that Samuel David Robinson has won the William and Mary Law School's William Hamilton Prize, awarded to "the student with outstanding performance in legal history," reminds me that other law schools give out similar awards. If yours does, please let us know the winner and something about his or her project! Peraza reviews Lubet, "Fugitive Justice"
Ruskola, Where is Asia? When is Asia? R. B. Bernstein reviews "Abraham Lincoln, Esq."